James Madison claimed their second FCS National Championship in school history. (Photo Courtesy of JMU via Twitter). 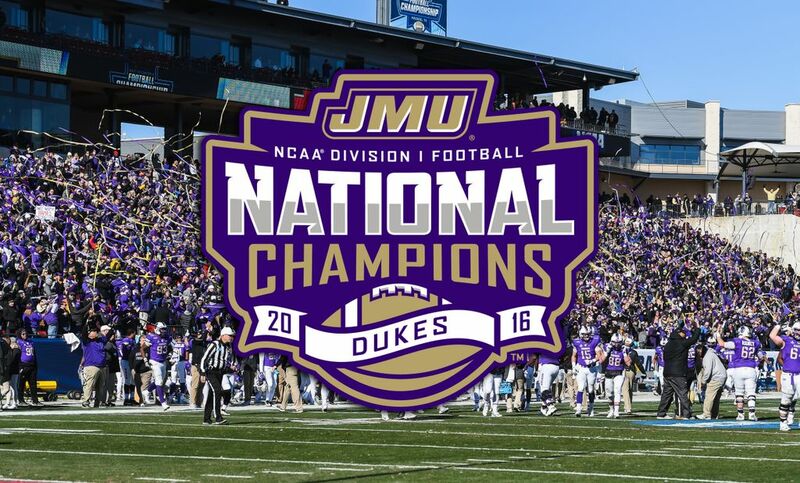 The James Madison Dukes won their second FCS National Championship in school history after defeating the Youngstown State Penguins 28-14. The Dukes used an impressive defensive performance in which they recorded 5 sacks, forced 3 turnovers, and held the Penguins to 21 yards rushing on 31 carries. The Dukes were playing without star linebacker Brandon Hereford due to suspension and then lost fellow linebackers Dimitri Holloway and David Ezeagwu midway through the first quarter. That makes their performance even more impressive. The Dukes were able to get going with their special teams blocking a punt to give them a short field. Two plays later, Bryan Schor hit Jonathan Kloosterman for a 14 yard score and a 7-0 James Madison lead. The Penguins had a poor punt on their next drive and the Dukes made them pay again with Schor hitting Rashard Davis for an 18 yard touchdown on a controversial call. Rashard Davis makes an INCREDIBLE snag for another JMU TD! Trailing 14-0, Youngstown State had a decent drive going that resulted in a 45 yard field goal attempt, but the kick never got off as the snap was fumbled. Two drives later, James Madison got big back-to-back pass plays from Schor to Davis (33 yards) and Domo Taylor (31 yards). The drive resulted in Khalid Abdullah punching it in for a 21-0 lead. The Penguins did get a late first half score thanks in large part to a partially blocked punt that set up Hunter Wells hitting Shane Kuhn for a 17 yard touchdown. That made it 21-7 at halftime with the Dukes holding a commanding yardage edge of 208-88 after 30 minutes. The Penguins started the second half with the ball, but a fluke interception (video below) gave the ball back to James Madison. YSU committed two defensive pass interference penalties on the drive and Abdullah ran it in from 2 yards out to extend the lead to 28-7. The Penguins mounted another solid drive, but a snap over the head of Nathan Mays was recovered by JMU’s Darrious Carter. The Penguins next drive required a fourth and 12 conversion, but the potential touchdown was broken up and the Dukes took over. James Madison controlled the contest for the remainder of the game with Youngstown State scoring a garbage time touchdown. Wells found Jermiah Braswell for a 7 yard score to close the game out 28-14. The Penguins were led by Wells who threw for 271 yards with 2 touchdowns and an interception, but he was harassed for most of the game. Jody Webb had 41 yards rushing on 17 carries to go with 10 catches for 63 yards while Alvin Bailey finished with 7 receptions for 68 yards. It was not a spectacular offensive performance from the Dukes, but it did not have to be. They were efficient with Schor going 7 of 12 passing for 112 yards with 2 touchdowns and no picks along with 36 yards on the ground. Abdullah, who was named Most Outstanding Player, had 101 yards and 2 touchdowns rushing on 26 carries. The Dukes committed no turnovers. James Madison won their first title back in 2004 when they defeated Montana 31-21 with Mickey Matthews as head coach. This time it was Mike Houston in his first season leading the Dukes to a national title and a 14-1 overall record for the 2016 season.